My new years resolution for 2005 was to see as much of the Great Wall as I can, and I have been striving to fulfill it. This is the third report on my quest to see the Great Walls, following earlier ones in SFM #14 and #29. 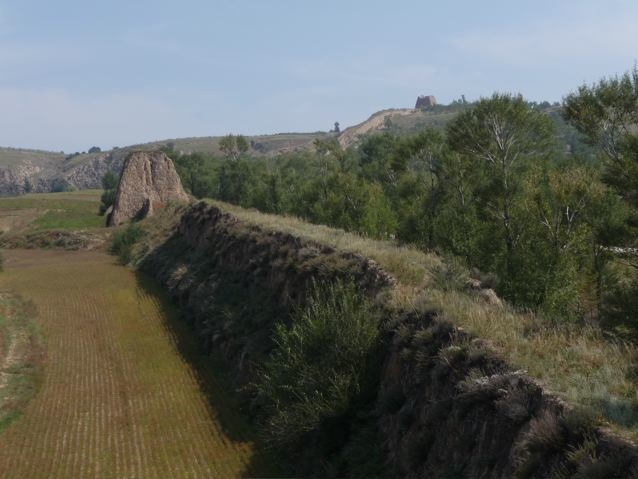 The Outer Wall runs along the borderland between agricultural lands of ShanXi Province 山西 and nomadic grasslands of Inner Mongolia 內蒙. The land is less mountainous and less defendable than the Inner Wall. The Wall here is built with rammed earth and often faced with bricks. Unfortunately, most of the brick facing have been stripped by residents nearby and the Wall’s rammed earth core is exposed to the elements. 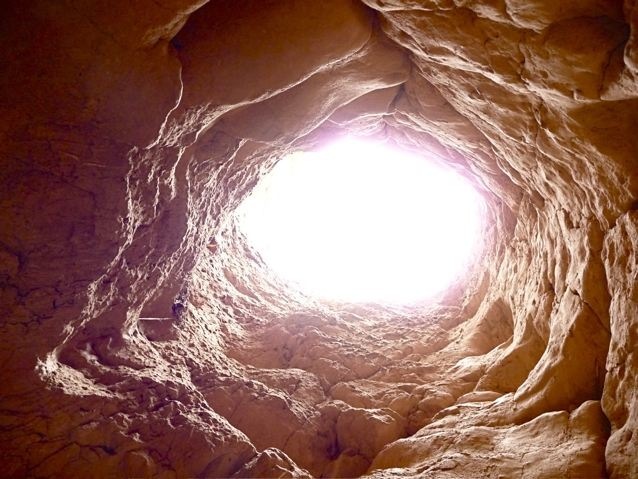 As the earth here is mainly loess, a fine and fertile clay, it could be pounded and compacted into solid and durable blocks. 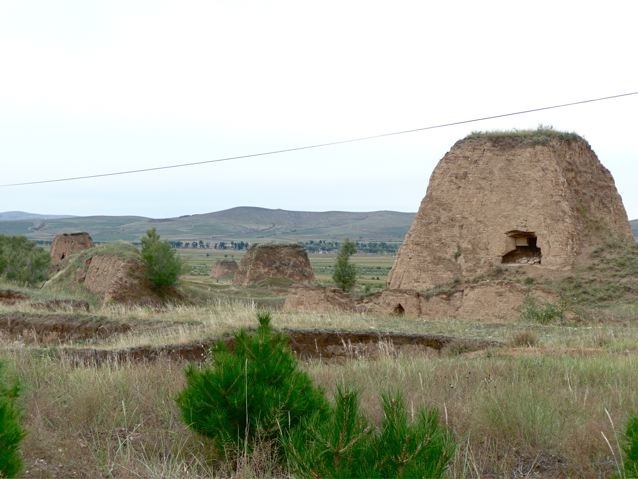 Miraculously, these rammed earth barriers and bastions are still standing after 600 years. 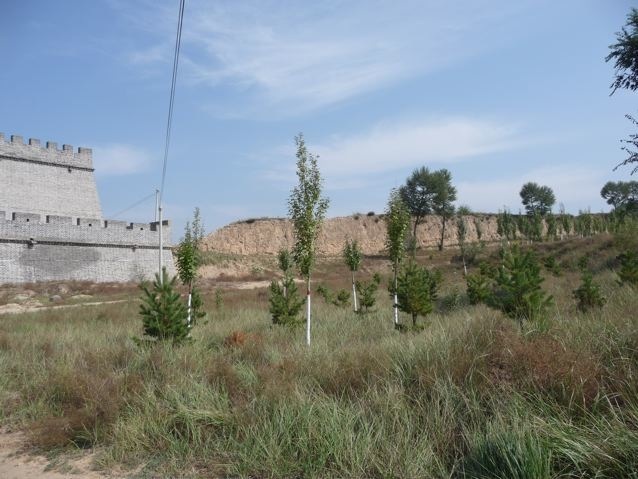 The Chinese government restores the Wall at places of tourist interest. Here, a restored section contrasts with an original section at Kill Tiger Pass 殺虎口. Bastions on the Wall serve as watch towers and battle stations. While most bastions are solid, this one is hollow and the top is accessible through an opening. The original stairway and other structures have deteriorated into a slippery ramp. On top of this bastion 600 years ago, Ming sentries would have stood here day and night, hot or cold, and kept vigilance for the telltale smoke and fire signals from faraway beacon towers. This shaft inside another bastion was too large, high, vertical and slippery for me to climb up. I had to be content with looking up at a small patch of the sky 坐井觀天. The Wall defensive system is composed of the Wall linked with bastions at intervals, gates and passes, battle towers outside of the Wall, forts to station troops, and beacon towers deep in hostile territories in the north. The system is an organic system that required constant attention of a million troops, and is effective in keeping nomads from raiding the farmlands when China was properly governed. 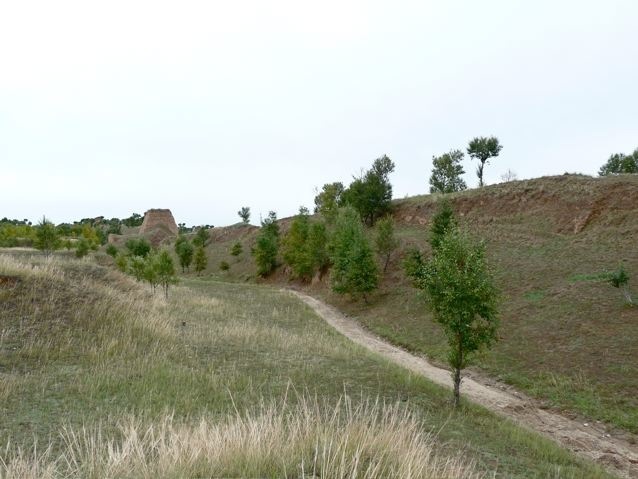 But during periods of turmoil when the Chinese government lost effectiveness, this system would fail and raiders could breach the Wall and wreak havoc.The Wall at Defended Pass 守口堡 demonstrates the many structures making up a defensive system. At the Defended Pass 守口堡 mountain pass, the Wall snakes down from the ridge and linked with a gate. The gate is gone, but the Wall is still standing on the ridge. 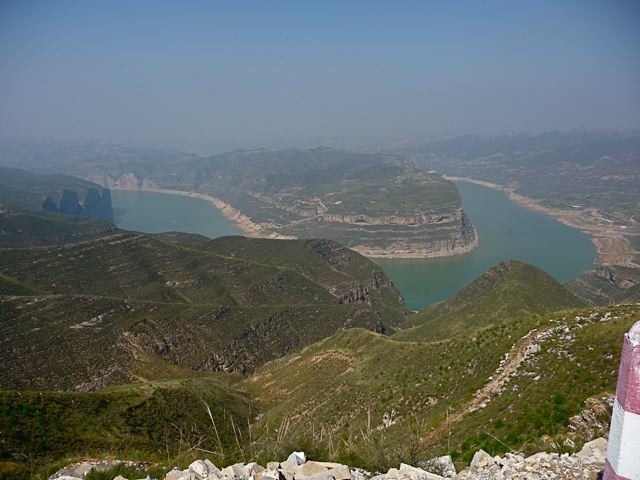 It is estimated that there are over 1,000 mountain passes throughout the Great Wall system. This is another section of the intensive clustering of bastions along the Wall and outside battle towers. 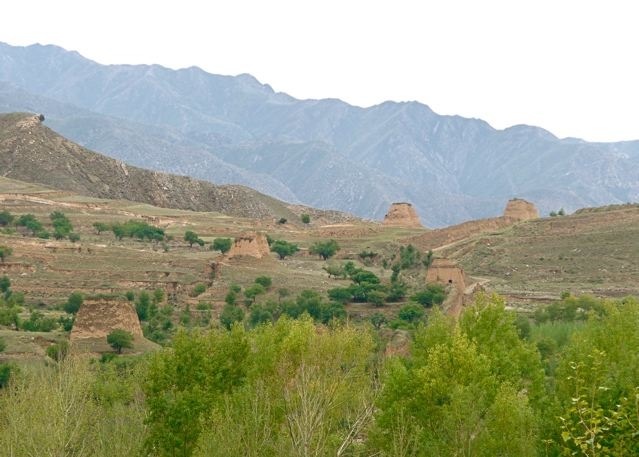 This terrain near the city of DaTong 大同 is not mountainous and needed a complex system to be an effective defense. The Wall itself is also built tall. The remnant rammed earth core is about 7 meters (20 feet) high. As the Outer Wall continues westward, the terrain becomes mountainous with deep gorges until the edge of the Yellow River 黄河. 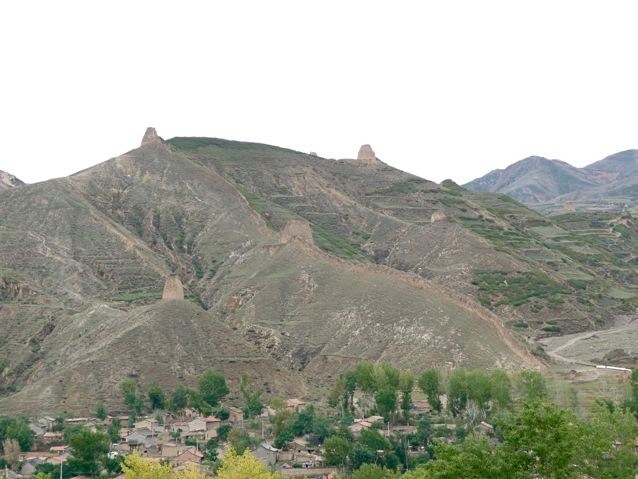 It is estimated that there were 10,000 beacon towers in the entire Great Wall system from the Korean border to the Gobi Desert. This particular sentry tower seems to have living quarters built into its side. 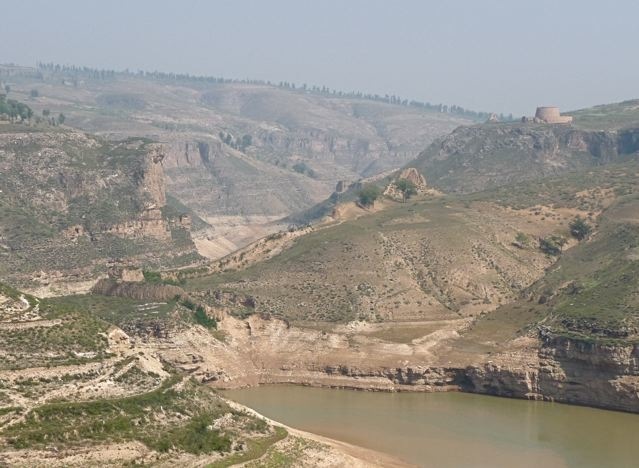 When the Wall meets the Yellow River, it plunges into its shore at LaoNiuWan 老牛灣 (Old Ox Bend). The Yellow River is locked in by impassable cliffs and mountains for a long stretch in this part of China. 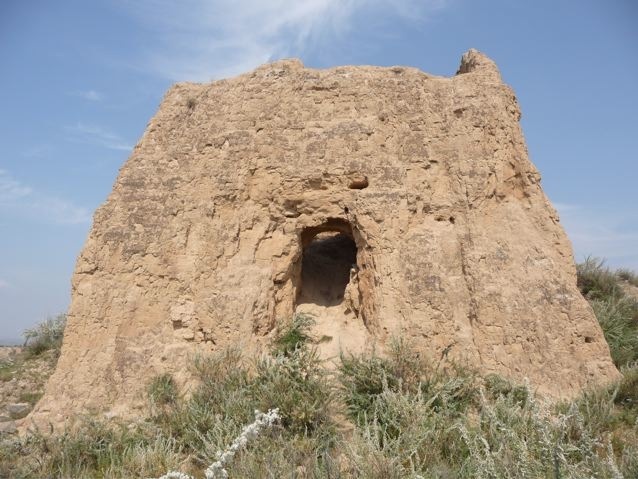 During the winter, raiders would ride on the frozen river and try to enter China proper by one vulnerable tributary river valley which is protected by a strong fort PianKuan 偏關. 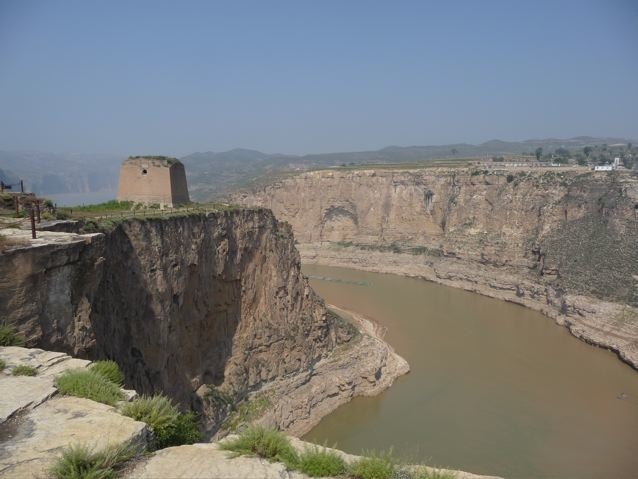 A garrison watch tower 望河樓 perches on a precipice overlooking the Yellow River and the typical riverside cliffs. 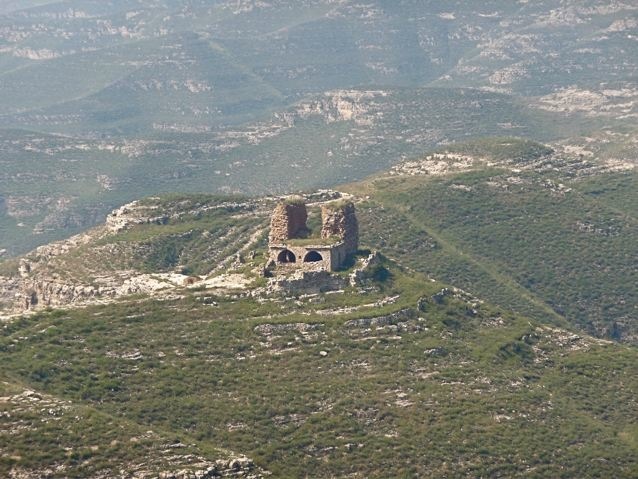 The hilltops and mountains along the Outer Wall are covered by remnants of the defensive system. They reflect the intense pressure from the northern nomads on the sedentary farmers of China proper and the fear they generated. Even when nomadic minority tribes conquered northern China and established sedentary empires such as Northern Wei 北魏 and Jin 金 dynasties, they would continue to build the Wall to defend against other practicing nomads. 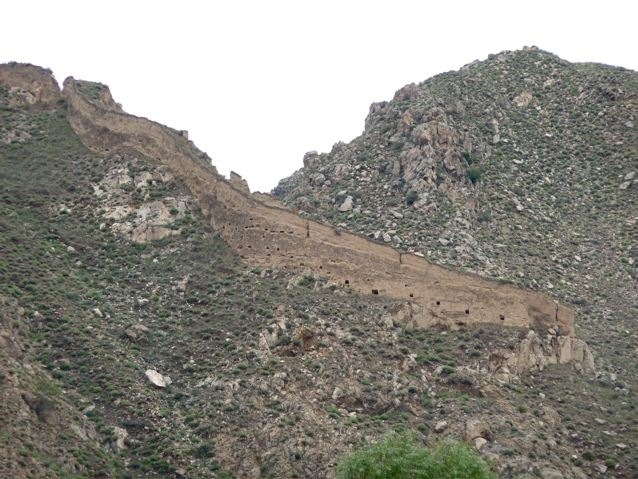 The Great Wall was almost continually being built and rebuilt for 2,500 years by various kingdoms and dynasties at great sacrifice and expense. By this count, it is the largest construction project of all times by any people on Earth. Posted by Robert Wu on Friday, January 9, 2009, at 6:54 pm. Filed under Uncategorized. Follow any responses to this post with its comments RSS feed. You can post a comment or trackback from your blog.